Someday I will make a big splash like my mom! 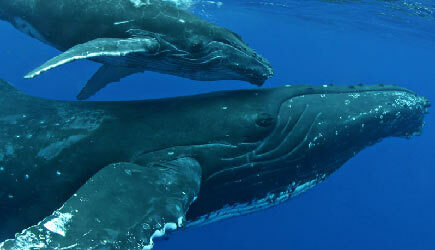 The whales have excellent vision and enjoy watching you too! 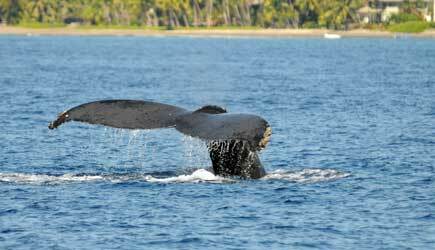 When you reserve a snorkel trip on the Lanai Explorer, receive a Whale Explorer whale watch for a discounted adult rate of $34pp (plus Hawaii sales tax and harbor fees of 7.167%)! 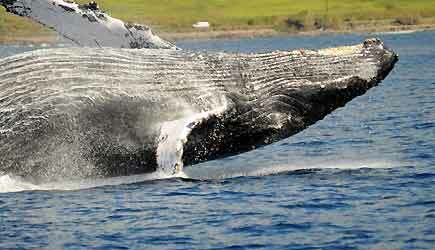 (list price is $49pp) The Whale Explorer is our favorite whale watch for several reasons. 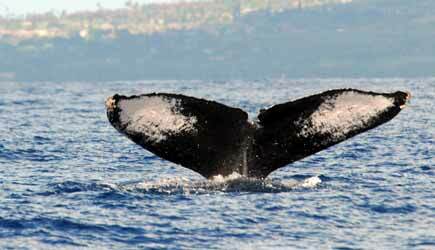 First, it leaves from Lahaina Harbor which is the closest departure point to the greatest concentration of whales in Hawaiian waters. 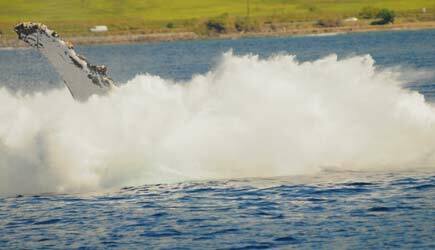 Second, the speed of the boat means that less time is spent getting too and from the whales and more time is spent actually watching them. Third, the size of the vessel means that every seat gets an excellent view of the action no matter which side of the boat has whale activity ... and sometimes they are on both sides! 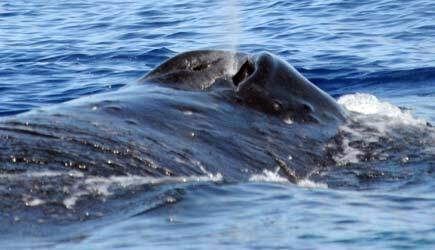 The tours must be done on separate days; the snorkel tour should be done first and the whale watch second in order to qualify for this rate. Whale Explorer is available 7 days a week at 8am, 10am, and 12:30pm until April 15th. One snorkel site and dolphin searching along the south coast of Lanai, and then the Lanai Explorer lands at Manele Bay Harbor. You get to spend three hours on the island of Lanai, exploring some fabulous isolated beaches that are a 7-10 minute walk away. More great snorkeling is available at the beach, and don't miss the fascinating tide pools found nearby. This 6.5 hour trip is perfect for people who want to go on a snorkel trip to Lanai, but who don't want to spend the entire time on the boat. During the three hours on the island you are on your own and free to go off on your own. Breakfast and a deli lunch are included. The boat is fast, fun, and comfortable with a maximum capacity of 35. 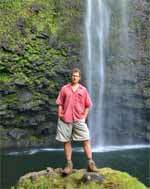 This is the highest rated snorkel tour that we offer based upon client feedback as well as our own experience. This tour is offered on Mondays, Wednesdays, and Fridays at 9:30am. Here is the adult list price and our special combo rates for the Lanai Explorer with Landing and Whale Express: Lanai Explorer snorkel trips has a $6 per person fuel surcharge per adult and child that is not included in these rates. This tour is operated on the same boats that do the Lanai Landing, but with a shorter itinerary. Instead of landing at Manele Harbor and giving you three hours to explore the island of Lanai, the boat goes to a second snorkel stop of about an hour in length somewhere along the Lanai or Maui coastline. Two snorkel sites, breakfast, deli lunch, and dolphin watching in a 4.5 hour trip. This tour is offered on Tuesdays, Thursdays, and Saturdays at 7:30am. Here is the adult list price and our special combo rates for the Lanai Explorer (no landing) and Whale Express: Lanai Explorer snorkel trips has a $6 per person fuel surcharge per adult and child that is not included in these rates. 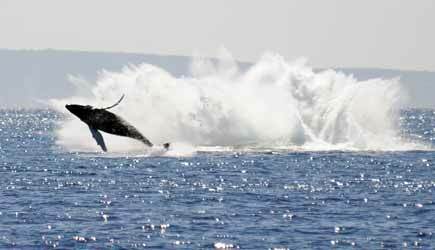 Lanai snorkel and whale watch combo is not really practical for any cruise ship passengers as it requires multiple days to do both tours. It is practical though to do one or the other. 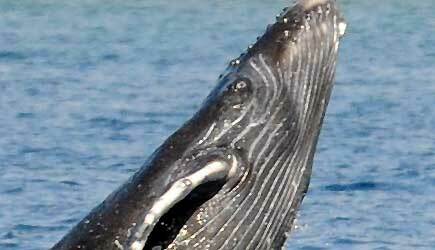 For details on Lanai snorkel tours that work with cruise ship itineraries, see our Lanai Snorkel page. 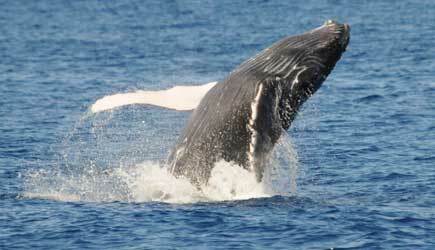 For whale watches, see our Maui Whale Watching page. What kind of tips can I give you on this page? 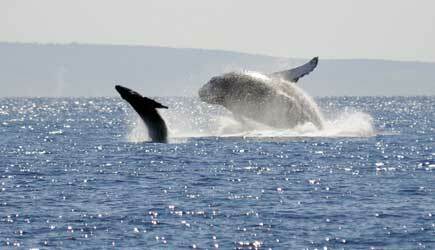 You can read Lanai Snorkel tour tips on that page, and you can read whale watching tips on that page. All that really needs to be said here is "If you are going to do both, book this combo and save!" Who doesn't like to save money? Please be aware that the minimum age for this combo is 5 ... this isn't an appropriate choice for families with really young children or women who are pregnant. This is one of those tours with the standard "high-adventure" limitation ... no pregnant women, no neck or back injuries, etc.